DreamHost is a popular web hosting provider and domain name registrar. Its hosting network of shared and dedicated systems is generally well-regarded. Today, though, users online loudly complained they were last to know — and that the company had hours to better prepare them for a forced password change. 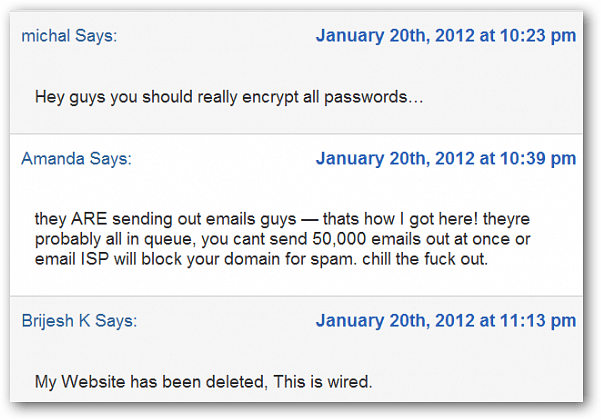 DreamHost is advising all customers to change shell/FTP passwords, a move that has website owners in an uproar. WordPress also Tweeted all DreamHost users are urged to change their passwords asap. As these types of attacks are happening more and more often to companies, it’s incredibly important to make sure you have strong passwords and change them regularly. Check out our guide on how to create easy to remember strong passwords. This isn’t the first time DreamHost has found itself on the wrong end of the stick. In 2010, the service was down five hours due to a denial of service attack. If a database at dreamhost was compromised then it’s logical to assume all the FTP and SHELL accounts were also considered. That said, in order to compromise wordpress logins, you would need to get access to each of the databases hosting the wordpress installs then grab the account usernames and PW’s. It’s a very very long-shot. That said (again…) better safe than sorry from a security standpoint. Best to think of it as a good opportunity to change passwords and freshen security up a bit. All good things to do every few months if you care about your site! I have a big experience about hacking. But this hacking like a friendly match to alert me against hacking. We know a first grade student never stay against tenth grade student in computing. So that’s true definition of hacking which I face. I am not knowing more about hacking threads that tme. But I promise I stay with confidence shortly against hacking without anyone support.